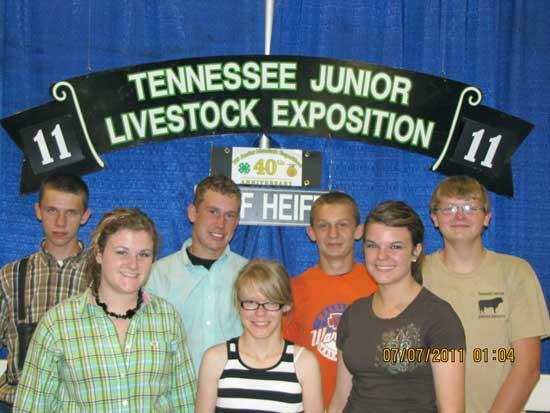 Pictured is (1st row L to R): Amelia Higgins, Chloe Dill, and Allison Higgins; 2nd row (L to R) Cody Hurley, B.J. Daniel, A.J. Daniel, and Paul Steelman, at the 40th edition of Tennessee Junior Livestock Exposition Beef Events held recently at MTSU. Cody Hurley placed 1st in his class of Hereford Heifers, A.J. and B.J. placed 2nd and 3rd respectively in their class of Polled Hereford Heifers. Paul Steelman placed 3rd in the Commercial Heifer show with his Commercial Heifer, and 2nd with his Limousin Heifer in the Limousin breed show. Chloe Dill exhibited the Reserve Grand Champion Bred and Owned by Exhibitor in the Commercial Heifer show and placed 2nd at the Regional Skillathon Contest. Allison Higgins won Grand Champion Honors in the Bred and Owned by exhibitor in the Chi-Influenced breed, with Amelia receiving Reserve Champion Honors, and placed 4th and 5th respectively in the premier exhibitor competition. Special thanks to the exhibitors, parents and others who worked to make the week a success. Congrats to all these young people. They deserve the recognition for their hard work. So glad the Cannon Courier recognizes the young people of this county. We need more stories of the accomplishments of the youth and their success.